Home » Recipes » Gluten Free » So Easy Bean Tacos! Open up a can of black or kidney beans, drain fluid from can but don’t rinse. Place them in pan and heat medium-low for 3-5 minutes. *If you’re watching your sodium levels, rinsing can cut sodium up to 40%. Wash and chop lettuce and tomatoes. 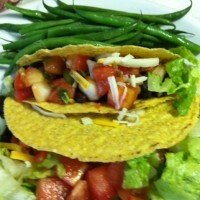 Place warm beans in taco shell, top with cheese, lettuce, tomato and salsa. Serve with side veggies like ready washed and microwaveable green beans. Eat and Enjoy! Comment on So Easy Bean Tacos!